As we have a free UK delivery offer on 4’ door canopies this month (January 2017), we thought it would be really helpful to elaborate on some of the wonderful heritage properties our canopies adorn. This should help you to imagine the smart effect available for any bare doorways in need of stylish shelter. Firstly, an idea of some of the very special old properties on our doorstep. Whilst our customers order our metal garden structures from all over the UK and beyond, we often receive enquiries from closer to home. We’re so lucky at Garden Requisites for our showroom and workshop to be situated in pretty Batheaston, not far from the UNESCO World Heritage City of Bath. 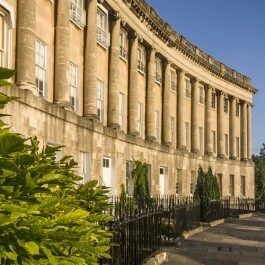 Bath is renowned for its Georgian townhouse architecture with the majority of the city gleaming in its iconic pale, locally mined, Bath stone (an oolitic limestone). Georgian architects John Wood the Elder and John Wood the Younger built much of the city’s grand terrace houses in the 1700’s in a style evolved from Palladian revival of the early 18th Century. A shining example of this work is the Royal Crescent, designed by John Wood the Younger and constructed between 1767 and 1774. It’s hard to believe that this striking design and buildings are 250 years old but the houses are still lived in and very well-kept and this is the same of period places throughout Bath and the UK. Generations of craftsmen have helped maintain these beautiful properties and, at Garden Requisites, we’re honoured to play our part too. What was often originally lead metalwork used for door canopy and porch roofs can now be replaced with very long-lasting sympathetic designs in zinc galvanised steel. It is so important that the longstanding legacy of this impressive architecture in period properties is respectfully renovated and enhanced through the years. There are more modern properties in Bath, of course. Town development is strict and craftsmanship for new houses needs to be top notch to pay satisfactory homage to the old style. 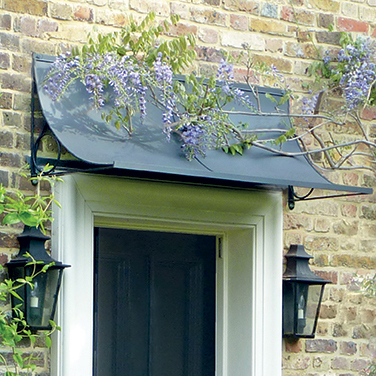 Garden Requisites’ carefully crafted door canopies come in different styles that sit beautifully in many types of period property – Georgian, Edwardian, Victorian – as well as newly built places that need well-considered door detailing. Instant kerb appeal can be created from a choice of Scoop and Arched designs, in zinc galvanised steel – solid or traditional wirework. Canopies can provide welcome shelter for all the downstairs exterior doorways, including garden and patio doors too. If you’re considering a heritage house restoration or interested in improving the look of a more contemporary home, do give Hilary and team a call. No self assembly is required for our canopies and they are simple to fix in place. We can also look at bespoke sizes and varying lengths of canopy if our standard lengths don’t fit. Oh, and don’t forget our offer on 4’ door canopies for January 2017 – FREE UK Delivery for orders placed in January. Save £39.50!